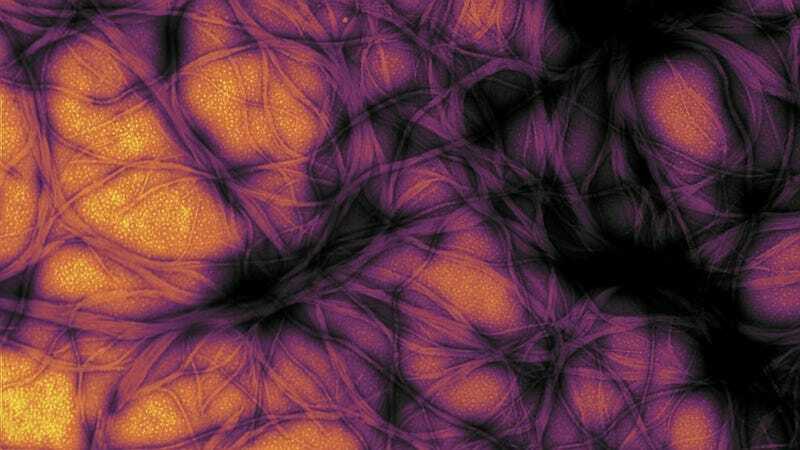 Prion protein fibers, seen above, cultivated in E. coli bacteria. Among the myriad of things that can sicken us, prions remain one of the creepiest pathogens out there. A new report, published Thursday by the Centers for Disease Control and Prevention, highlights yet another reason why: People can come down with a prion disease at least 30 years after first being exposed to it. Prions are the misshapen form of proteins readily found in our brain. When prions are next to their normal counterparts, they very slowly, but relentlessly, convert them into more prions, like a microscopic Agent Smith from the Matrix. Little by little, the growing army eats away at the brain, causing telltale, microscopic spongy holes. It can take years, even decades for a prion disease to become noticeable, but once symptoms like dementia or muscle spasms appear, it’s universally fatal, typically within a few months to two years. Japanese researchers dug through records and identified 22 patients within the country who had developed a specific form of Creutzfeldt-Jakob disease (CJD), a neurodegenerative disease caused by prions, since 2008. These patients had caught CJD from contaminated dura mater grafts (dura mater being a tough membrane that coats the brain and spinal cord) used to help their brains heal after surgery. One patient in particular had their graft implanted in 1985 and only developed CJD 30 years later, in 2015. The newer cases bring the tally of dura mater graft-associated CJD (dCJD) cases documented in Japan since 1975 up to a total of 154, the authors reported. That represents more than 60 percent of dCJD cases seen worldwide (four have been seen in the US). These prion diseases, or spongiform encephalopathies as they’re formally called, can be transmitted by close contact with infected bodily fluid or brain matter; can be caused by mutations that run in the family; or can even appear out of nowhere with seemingly no underlying cause. Genetics might also play a role in how vulnerable we are to contracting a transmitted prion disease. It’s estimated that about one in a million people annually develop some form of CJD, by far the most common human prion disease. Cases of dCJD have centered around Japan because the brand of dura mater graft primarily responsible for the initial outbreak—Lyodura—was most widely available and used there. Unbeknownst to anyone at the time, the grafts (as well as some stocks of human growth hormone) were created using deceased donors who had CJD. And the standard method of decontamination, gamma radiation, did absolutely nothing to kill prions. By 1987, soon after the first cases of dCJD were discovered, Lyodura changed their sterilization methods, while other graft companies steered away from using dead human donors. Unfortunately, some patients were given older Lyodura grafts that remained in stock after 1987. The grafts had a five-year-old expiration date, but in at least one case, a patient was given a graft found to be expired. The three most recent cases seemingly occurred during surgeries performed in 1993, all involving Lyodura grafts. It’s almost inevitable that a few more new dCJD victims will sprout up in the years to come, the authors believe. From 1983 to 1987, they noted, 20,000 people in Japan received a Lyodura graft, a number fiftyfold higher than in the US. Lead author Ryusuke Ae, a public health researcher at Jichi Medical University, told Gizmodo via email that graft patients in Japan may have been exposed to tainted Lyodura products after 1993 as well. “Although the US government prohibited using Lyodura as soon as the risk was reported in 1986, the Japanese government did not until 1996,” he explained. The maximum length of time it can take for CJD and other prion diseases to appear is also still up in the air. Ae says that the 30-year-latency period his team documented is the longest of any confirmed case of transmissible prion disease. But there’s speculative evidence of even longer examples. The now virtually extinct Kuru disease, seen among members of the South Fore tribe in Papua, New Guinea, was spread by a cannibalistic custom of eating the brains of the recently dead. But though the ritual was phased out by the 1960s, cases of Kuru are thought to have shown up over 50 years after it was first contracted. Research in animals has also suggested that cases of variant CJD, spread by eating meat contaminated with the prions that cause Mad Cow disease, might vary widely in their incubation periods, possibly due to the victim’s genetic make-up. Some people with acquired CJD might even, perhaps fortunately, never know they had it, Ae says. Because of that uncertainty, in addition to maintaining and establishing methods to prevent transmissible CJD, Ae and his team say, it’s important to create a more extensive surveillance system that can find still-hidden reservoirs of prion disease. Meanwhile, a new study also released Thursday by the US National Institutes of Health has found more evidence that even some genetic mutations known to cause prion disease in people can be transmittable.